FREMONT, Ohio – In any sport when you struggle you start to question yourself…you lose confidence. Sprint Car racing can amplify that feeling. Just ask Tim Shaffer. 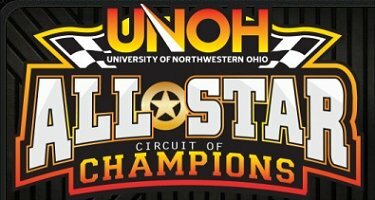 The former four time University of Northwestern Ohio All Star Circuit of Champions titlist won only one series event last year and this year has struggled. But, Shaffer and his Bryan Grove Racing team rolled up their sleeves and went to work, and it paid off Sunday at Fremont Speedway. “The Steel City Outlaw” would battle with James McFadden – the previous night’s winner – throughout the last half of the 50-lap race on Budweiser Night before grabbing the lead on lap 47 and drove to the $10,000 victory. It was Shaffer’s first All Star win at Fremont since 2012 and was his 9th career series win at “The Track That Action Built.” Shaffer now has 14 career wins at Fremont and 55 total All Star victories as he sits fifth on the series’ all-time win list, only one win away from hall-of-famer Jack Hewitt. “Hats off to the guys…Todd and Five-O…we have everybody here helping. Thank you. It’s been so tough. You go along there for a long spell…like a year and half and you’re struggling and struggling and you just keep fighting. It seemed like the harder we fought the worst it got and you get to a point where it’s like ‘can I drive any more.’ It’s great to be standing back up here again…it’s been a long time,” said an emotional Shaffer in the Engine Pro Victory Lane. “What’s amazing is I’ve been up here and I’ve gotten to win this a couple of times. If everything is going right and the car is operating and you do your job it will come to you. It’s 50 laps…you have to be aggressive but patient. I think these new tires have really thrown a loop to every body….it really changed how we feel in the car. It doesn’t feel good…nothing like it felt before. I just needed to man up and quit whining,” added Shaffer beside his Canton Erectors, VRP Shocks, Gressman Powersports, Helms Construction backed #45. For McFadden, who took the lead from Brady Bacon on lap 9, lost it on lap 28 to Shaffer, regained it on lap 31, lost it to Shaffer again on lap 43, regained it for a lap with four to go, only to watch Shaffer drive by for the win a lap later, it wrapped up a successful return to the United States. Since coming from Australia on Friday, McFadden has recorded a third at Plymouth, a win Saturday at Fremont and a second on Sunday against the UNOH All Stars. “It was a pretty cool race…I bet it was a great race for the fans. I got stuck a little bit behind that lapped car and I should have zigged when I should have zagged and it was enough to give up the lead. Congratulations to those guys. We’ve all struggled at times and to get that win is awesome. I’m happy for my team but a little disappointed. I kind of thought I threw that one away a little bit. We did 48 good laps and ran second,” said McFadden beside his Gaerte Engines, XYZ Machining, Townline Variety, All Star Performance, Hills Racing #3G. Current All Star point leader Dale Blaney rallied from near disaster on the first lap of the feature, and was closing on the top two only to run out of laps and finish third. “I was going to be patient there for awhile and I just got into two a little too low and hit that hole…I don’t know how it stayed on the ground. We lost so much ground there it was hard to make up. But, we got back to third and had a chance. If we could have gotten back to traffic about 10 laps of traffic it would have helped and given me an opportunity. I wasn’t as good as the 45 or the 3G. We’ll take third tonight,” said Blaney beside his CH Motorsports, Go Muddy.com, Big Game Tree Stands #1. Fremont’s Bobby Clark would dominate the Fremont Federal Credit Union 305 Sprint Feature that went non-stop for 25 laps. For Clark it was back-to-back wins as he now has four on the season at Fremont and the 33rd of his career at the track as he takes over sole possession of 12th on the track’s all-time win list. “I was good from the get-go. Hats off to my crew. They work their tails off and Dave (Foos, crew chief) loves when the track gets like this. It falls into our hands more. It was kind of easy to drive,” said Clark beside his Fremont Fence, Kear’s Speed Shop, B&L Plumbing, Nagy Equipment Sales, Miller Rigging, Kistler Engines, Willey’s Towing, Big D’s Pizza, Shellukes Bar, Fremont Auto Parts backed machine. Matt Foos of Fremont has had a fast dirt truck all season but has been caught up in crashes or has had mechanical issues. It all came together for him Sunday as he lead all 20 laps to score his third career Fremont victory in the AAA Ohio Auto Club Dirt Trucks. “We got fortunate enough to start on the front row tonight. Last week I put myself in a bad position. It feels like we’re way over due for this. I feel like we are always the truck to beat here,” said Foos beside his Fremont Fence, Automatic Fire Protection, M&L Excavating, Pit Stop Convenience Stores, D&R Transmissions backed machine. For the 50-lap 410 sprint feature Brady Bacon and Ryan Smith would bring the field to green with Bacon gaining the slight advantage over Smith, Blaney, Parker Price Miller, Lee Jacobs and McFadden. After a lap was completed Blaney would nearly flip in turn two, droving back to eighth. While Bacon and Smith battled for the lead McFadden quietly drove into third on lap four with Price Miller, Travis Philo, Shaffer, Jacobs and Blaney in tow. The caution would fly with six laps in the books for Nate Dussel who stopped on the speedway. When the green flew McFadden drove around Smith for second. While Bacon led McFadden, a great battle ensued for third involving Price Miller, Smith and Shaffer. Chad Kemenah would spin on lap eight for the second caution. On the restart McFadden blasted around Bacon for the lead with Price Miller in third followed by Smith, Shaffer, Philo and Byron Reed. By lap 10 Shaffer had climbed to fourth as the leaders prepared to enter lapped traffic. With 16 laps scored and in heavy lapped traffic, Shaffer would drive under Bacon for second and closed on McFadden. Lee Jacobs would bring out the yellow flag on lap 17. Now with a clear track McFadden was able to put a little distance between himself and Shaffer as Bacon, Price Miller, Blaney, Philo and Reed gave chase. Shaffer slowly began to reel in McFadden and by lap 21 was racing under the leader exiting turn four lap after lap as Bacon and now a closing Blaney gave chase. At the half-way point McFadden and Shaffer were side by side for the lead with Bacon, Blaney, Price Miller, Reed and Philo in pursuit. Shaffer would use a high move off four to take the lead on lap 28 with Price Miller bringing out the caution on lap 29. The restart order would be Shaffer, McFadden, Blaney, Bacon and Danny Holtgraver. The big crowd was also watching several cars march from the back of the pack including Greg Wilson who had moved from 26th starting spot to ninth, and Rico Abreu who drove from 19th to seventh. McFadden would drive under Shaffer to regain the lead on lap 31 and when Chris Andrews spun on lap 34 the red flag was displayed for a fuel stop. The restart order was McFadden, Shaffer, Blaney, Bacon, Reed, Holtgraver, Abreu and Wilson. The caution would fly for the final time on lap 37 for Steve Kinser. When the green flew McFadden would lead Shaffer, Blaney, Reed, Abreu, Bacon, Holtgraver and Wilson. With 10 laps to go Shaffer had caught McFadden and would drive under the Australian for the lead on lap 43. On lap 46 the leaders were into heavy lapped traffic and Shaffer and McFadden split the lapped car of Caleb Helms in turn two with McFadden leading lap 46. Shaffer would drive back by entering turn one to regain the lead. The final three laps Shaffer, McFadden and a closing Blaney ran nose to tail through traffic. Shaffer would drive to the win over McFadden, Blaney, Abreu and Reed rounding out the top five. Holtgraver would drive from 13th to sixth with Wilson earning the hard charger award by coming home 7th while Bacon, Cap Henry (from 20th) and Philo rounding out the top 10. In the 25-lap 305 sprint feature Trey Jacobs and Clark paced the field with Clark jumping into the lead as Jacobs fought with Jordan Ryan for second. Ryan would move into the runner-up spot on lap two with Jacobs, Josh Harrison, Seth Schneider, John Ivy and Steve Rando in tow. Schneider would take third on lap six with Ivy moving into fourth on lap nine. No one had anything for Clark who sliced and diced his way through traffic. With nine laps to go Clark held a straight-away advantage over Ryan with Schneider, Ivy, Rando, Harrison and Alvin Roepke up from 16th. Ivy would use traffic to get by Ryan for second with five laps to go with Schneider taking third. Rando would drive from fourth to second on lap 23. As Clark took the checkered, Rando was entering turn three. He would cross second but failed to go to the scales following the feature and was docked two finishing spots. So behind Clark it was Ivy, Schneider, then Rando and Ryan. In the 20 lap dirt truck feature Foos and Len Benyak would bring the field to green with Foos gaining the advantage over Brad Stuckey, Dan Roepke, Dana Fry, Curt Inks and Kent Brewer. Brewer would bring out the first caution on lap six just as Roepke took second. When the green flew Foos and Roepke pulled away from the battle for third involving Stuckey, Dustin Keegan, Brad Mitten, Cory Ward and Eric Devanna. The final caution flew with five laps to go with the running order Foos, Roepke, Keegan, Stuckey, Mitten, Devanna, Brandon Leighton, Inks, Brewer, Ward and Cory McCaughey. Again when the green reappeared Foos and Roepke checked out. The two would drive the final five laps nose to tail with Foos taking the win over Roepke, Keegan, Brewer and Stuckey. There will be no racing at Fremont Speedway on May 30th but the track will get back to action on Saturday, June 6 for the Vision Quest Hall of Fame Night. Prior to the night’s racing – which includes the Second Annual Race of Legends – the Class of 2015 will be inducted into the hallowed halls of the Fremont Hall of Fame.